Hi All, Newbie to the forums. Long time Klipsch fan (purchased first pair in 1984) but didn't know about the forums. Found out about them in the various Klipsch Facebook groups. To get to the point... I recently bought some used Palladium speakers (P-37Fs and P-17Bs). The center hole in the binding post only seems sized to accommodate the hex wrench that comes with the speakers. The banana plugs I have do not fit in them. Are the Palladiums not designed for banana plugs or are there smaller ones that will work with them. For now, I'm using some Monster Flex Pin connectors. Those work well enough but I'd prefer to use banana plugs. Thanks. Selling my front stage of Klipsch Palladium. I'm moving to a small town in the next month or so, and I'd like to take advantage of being in the Chicago metro area to sell these before I go. Towers are mint, but the center was a floor model, and unfortunately it shows. I have everything (boxes, packing, grills, accessories, etc.) for the towers. Center is missing its accessory kit, but has everything else. I'll let the photos speak for the condition on the center. There are no mashed corners, but it seems the finish on the top was redone, and it is more glossy than it should be. There is also some speckles from the process that are on the front of the speaker. I'm guessing this should come off with the right chemical, but it's not visible from more than about 3 feet away, so I left it alone. The woofers also have some slight marks in them from someones fingers. The grill has no issues. These are located in the west Chicago suburbs, and I would like to stay local for now, despite having the packaging. I would consider shipping via freight if someone wants to send the freight forwarder to me and have them palletize the bundle. Priced firmly at $3,700 for the bundle. Please let me know what questions come to mind. Thanks! Any klipsch p27c palladium center for sale... used or new.? I just bought Palladium 37F's and jumped them into a system that had a pair of RF7's. I've been biamping the speakers by utilizing the unused rear effect amp, same as I did with the RF7's. I'm worried that I'm underpowering the Palladiums. I have an Arcam380 AVR, 90W x 2 channels, 75W x 7 channels. With the RF7's being 8ohms and the Palladiums being 4ohms, do I run the risk of frying the receiver or worse the speakers. I've tried to read some technical threads and articles about the 4ohm/8ohm discrepancy but get lost in the jargon. Can I preamp out just the low frequency channel to a separate amp. (I have an old Hafler XL600 I could utilize for this purpose.) I'm not looking to spend any $ at this time on equipment upgrades, I didn't even want to spend the money on the speakers but at the discounted price I pulled the trigger. Any advice would be great. BTW, the sound improvement between the RF7's and the Palladiums is dramatic. I am seeing Palladiums heavily discounted, as in about half MSRP (on Amazon via Sound Distributors). What the heck is going on? Are they being discontinued? Is something new coming? Might be time to get some. Changed my setup a little. Here are some new plots. Note that I use the Dirac house curve that tilts the low end up 2 dB and high-end down a 2 dB. I just like the way it sounds with the default Dirac house curve. 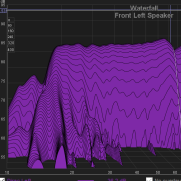 I really just can't get over how that there is almost no ringing at 40dB down at 30 Hz and below (compare old blue and yellow waterfall plots to purple ones). Sounds absolutely incredible, best bass I have ever heard and less than 1% total THD as measured by REW and a MiniDSP calibrated USB mic.